This unique and innovative design will distinguish the discerning professional and protect your business cards, keeping them in pristine condition. 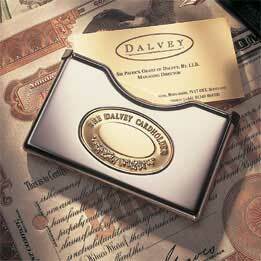 The Dalvey Business Card Holder is lined with a protective Santoprene insert and incorporates an ingenious spring loaded mechanism which securely retains up to 15 standard business cards, even when held upside down. Ensure that every business card is completely protected and presented in immaculate condition, a respected ambassador for both you and your business. 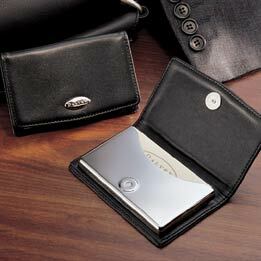 Handcrafted from fine leather and high quality stainless steel The Dalvey Leather Business Card Holder holds up to 15 standard business cards and is sure to make the right impression.